When we make friends we like to learn about them—we ask them where they grew up, where they went to school, and when they were born. Our homes are a lot like that. We spend time with them, value them, and take care of them. So it makes sense that we want to know more about them—who lived there before, how it’s changed over time, and when it was built. If only walls could talk, right? Instead, here are 10 ways to uncover the story behind your older or historic home (or any other building you’re interested in). Look closely at your house. Exposed rafters in the attic and bricks in the basement can tell you a lot about how old your house might be. You might find dates or stamps left by the builder; different-sized bricks will tell you that the house was built in different construction cycles. Tip: Closets are great places to uncover clues like old wallpaper or paint -- certain paper patterns or color-schemes can be traced back to a popular period style. Be your own archaeologist. Scope out your backyard the next time you’re in the garden and look carefully at buried treasure you might find, like old glass bottles or children’s toys. Items like that can tell you a lot about who lived in the house and when. Talk to people. Talk to your neighbors, local business owners, even the mailman. They might be able to tell you who lived in the house before you and remember if any changes have been made to it over time. Explore the neighborhood. Are there other older buildings that look similar? How does your house fit in—for example, does your house face a different way? It could have been built on land that was once a farm while the rest of your neighborhood was built later. 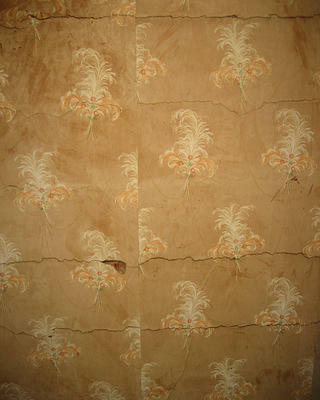 You can find old samples of wallpaper in closets, attics, and other forgotten rooms. Tip: If you live near a city, measure the distance to the city center. The farther you are from the original core, the younger your house might be. Learn the history of the area. How old is the city or town you live in? Did any major events take place in the area? (For example: Was it the scene of a battle? Was your home, or any other nearby building, designed by a noted architect?) Answering these questions can offer important clues to your house’s own history. Check your historic district status. If you don’t already know if your house is designated as a historic structure, you can check with your State Historic Preservation Office (SHPO) or other local preservation office. They will also be able to tell you whether you live in a historic district. 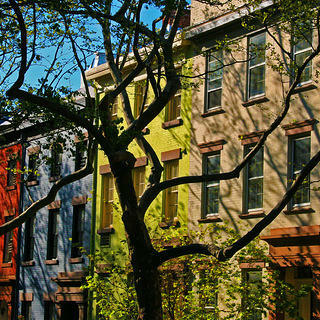 Tip: Look for properties in your area on the National Register of Historic Places. Research land and property records. A simple deed or title search can tell you who owned the property and when and tax records can tell you how the property has changed over time. Many city or county records offices also have Sanborn fire maps, which can date back as far as the 19th or 20th centuries and show the footprint of your house and layout of the neighborhood. Look up local census data. Census records can tell you more about the lives of previous owners, like the number of children in the house, cost of the home, whether the home had a radio, and more. Tip: Stop by your local public library and look for a city directory—a precursor to the modern phone book—which might offer more details on previous occupants. Contact your local historical society and visit your public library. Ask to see old photographs they might have of your house or the surrounding land, historical maps of the area, or newspapers with specific articles that reference history of the local town. Read! There are many books out there to guide you further in your research, such as Nearby History: Exploring the Past Around You by David E. Kyvig and Myron A. Marty; or Discovering the History of Your House and Your Neighborhood by Betsy J. Green. Search your public library or local bookstore for more titles. You don’t need a master’s degree to learn about the history of your home, public building, or any other place. All you need is a little time, your eyes, ears, and feet … and 10 helpful tips to get you started. Bonus: Check out the University of Maryland University Library’s webpage on researching historic houses. You’ll find the information there can be applied to places nationwide.